Andrew Rassweiler, Senior Director of Teardown services at IHS Technology, shows off some of the components found in various modules of a recently analyzed Tesla Model S.
Everyone knows that Tesla Motors Inc. doesn’t do things the same way as other automakers. However, the company’s unique approach to automaking runs far deeper than the Model S’s electric drivetrain, battery packs and futuristic body. In fact, the company’s unconventional approach extends all the way down to the electronics behind the car’s infotainment and instrumentation systems, according to the Teardown Analysis Serviceat IHS Technology. A physical dissection of the Model S reveals that in terms of design, components and manufacturing, these user-oriented subsystems have more in common with a tablet or smartphone than they do with a conventional automobile. 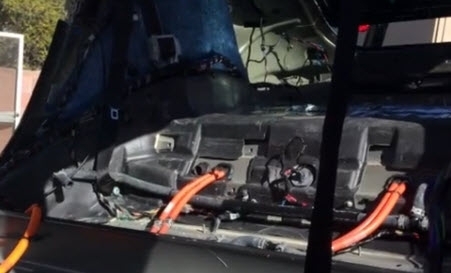 IHS is in the process of conducting a complete teardown of a Model S, dissecting and analyzing each subsystem, from the air-conditioning controls, to the safety systems, to the powertrain. The initial analysis focuses on the car’s two most electronics-intensive segments: the virtual instrument cluster and the premium media control unit—aka the head unit—which is the main center stack and touch-screen panel. A huge 17-inch display and touch screen, which is much larger than the average automotive infotainment interface. The use of an NVIDIA Corp. Tegra 3, 1.4-gigahertz quad-core processor, providing computing power in the same league with recent smartphone and tablet designs. The most complex automotive head unit design ever seen by the IHS Teardown Analysis Service, with more than 5,000 discrete components—1,000 more than the highest-end infotainment unit previously analyzed. A bill of materials (BOM) for the virtual instrument cluster and the premium media control unit that is roughly twice the cost of the highest-end infotainment unit examined by IHS. The cost structure of the Model S’s premium media control unit closely resembles that of a smartphone or tablet because the display and touch screen are the two most expensive subsystems, the same as for an iPhone or iPad. The high cost is due to the sheer scale and size of the display and touchscreen.